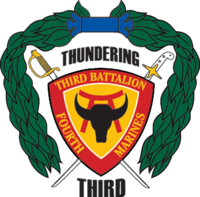 3rd Battalion, 4th Marines (3/4) is an infantry battalion of the United States Marine Corps. Nicknamed "Thundering Third". The most recent leader Lt. Col. Birchfield III, J. W. radio callsign is "Darkside". They are based at the Marine Corps Air Ground Combat Center, Twentynine Palms, California, and consist of approximately 1,000 Marines. The unit currently falls under the command of the 7th Marine Regiment, 1st Marine Division, but — along with its two sister battalions — is hosted by the 3rd Marine Division, at Camp Schwab in Okinawa, Japan, when training in jungle warfare. The 3rd falls under the 4th Marine Regiment at such times. Company M (Mike Company) - Currently in use as a Remain Behind Element for combat replacements of forward deployed elements. The battalion was first activated in 1925 at Naval Base San Diego, California. Since its initial inception in 1925, this unit has had several periods of activation. On May 1, 1941, at Cavite, Philippine Islands became the First Separate Marine Battalion, Navy Yard, Cavite. Relocated during December 1941 to Corregidor, Philippine Islands. Redesignated January 1, 1942, to the Third Battalion, Fourth Marines, Corregidor, Philippine Island. The 4th Marine Regiment participated in the Battle of Corregidor from January to May 1942. The unit was surrendered by an Army General and subsequently captured by enemy forces on May 6, 1942. After this 4th Marines temporarily ceased to exist. In August 3/4 was back in Phu Bai again running patrols and ambushes in search and destroy missions. Early September the battalion moved its HQ 55 miles north to Đông Hà. On September 22, 1966, the battalion was again in action against the 324B NVA Division in Operation Prairie which ran from August 3 to October 27, 1966. Fighting for Hill 400 and Hill 484 and also called Mutter's Ridge in the Razor Back Mountains, a heavily fortified Nui Cay Tri ridge. It was very costly for both sides, losses were put at nearly 1300 NVA killed and total Marine losses were put at 200 killed and over a 1000 wounded. Captain James J. Carroll was later posthumously awarded a Navy Cross for valor on Hill 484. On January 31, 1967 Operation Prairie II started. On February 27 L/3/4 and a tank platoon was involved in a battle near Hill 48 to save a recon team that ran into a NVA Regiment. On the 28th other Marine companies including M/3/4 were brought in for ground operation. When the operation ended total casualties for both sides were put at 93 Marines killed 483 wounded and the NVA losses were put at 694 killed. Prairie II ended on March 18, but Operation Prairie III started the next day. The battalion was pulled back to regroup and rebuild. For the next couple of months the battalion worked Route 9 guarding lines near Cam Lo, The Rockpile and Camp Carroll, which was the largest concentration of artillery pieces in northern I Corp. July and parts of August it was time for the battalion to spend time in the "Barrel", Con Thien. On September 4 the Battalion was ambushed just south of Con Thien with heavy casualties. 3/4 was pulled back for rebuilding its manpower. Some of the other major Operations in 1967 were Operation Hickory (May 18 to May 28), Operation Kingfisher (July 16 to Oct 31) and Operation Kentucky near Con Thien in the western area of Leatherneck Square in the latter part of 1967 and in January 1968. Other operations the Battalion participate in 1968 and 1969 were Operation Lancaster II (Jan 21 to Nov 25, 1968), and Operation Robin (2–19 June) along Route 9 southeast of Khe Sanh. After November 6, 3/4 was the last infantry battalion of the 3rd Marine Division left in South Vietnam. On November 24, 1969, the battalion sailed from Vietnam to Okinawa. The first Marine unit in combat in Panama during Operation Just Cause was India Company, 3/4. They landed in Panama on April 6, 1988, and by April 10 were engaged in combat with clandestine units from Cuba. Some might have been from the 7th Company of the Panamanian Defense Forces, known as the "Macho de Monte" or "mountain machos", a special ops / guerrilla warfare unit named after a sort of aggressive wild boar. 1996–1997 saw the battalion participate in Operation Hunter Warrior (Sea Dragon). The objective of the operation was to test experimental gear, weapons and other equipment essential to a Marine Rifle Squad. In 1998 the battalion was transferred from Camp Pendleton, California, to Marine Corps Air Ground Combat Center in 29 Palms, California. There they worked back to full battalion strength and prepared for deployment to Camp Schwab, Okinawa in 1999–2000. The April 2003 toppling of Saddam Hussein’s statue in Firdos Square in Baghdad shortly after the Iraq War invasion. 3/4 deployed to Kuwait in January 2003 and went on to participate in the 2003 invasion of Iraq. The group was led by Lt. Col. Brian P. McCoy. They were the first U.S. Marine unit to enter Baghdad. This battalion was shown in the famous scene of the statue of Saddam in Firdos Square being pulled down. The battalion redeployed to Iraq in March 2004 and subsequently took part in Operation Vigilant Resolve while attached to the 1st Marine Regiment. They subsequently deployed to Fallujah, Iraq in January 2005 and provided oversight for Iraq's first national election in decades. 3/4 deployed again in September 2006 to the Al Qaim region in the Euphrates River Valley of Iraq, in Western Al Anbar Province, conducting counter insurgency combat operations and support and security operations. 3/4 saw heavy fighting throughout the deployment. The Marines were spread out in individual platoon-sized combat outposts along the river side, where fighting was especially intense, particularly in the first half of their extended 9-month deployment. Around Spring time in the second half of the Marines' deployment, the fighting turned to more small scale ambushes and IED attacks conducted by the enemy, who had become increasingly affected by losses in manpower and equipment in the large scale fighting that took place throughout the Fall and Winter months of 2006 and 2007. The battalion suffered 12 KIA, and over 100 WIA during the nearly 9-month deployment, which was due to being extended for the Troop Surge in early 2007. After returning home to Twentynine Palms in late May, 2007, the battalion again deployed in early 2008 to Al Anbar with dual missions of carrying out combat operations, training Iraqi security forces, and supervising the Iraqi peacekeeping effort. Their area of operations reached from Haditha to Hit, becoming the largest area any military unit had controlled in support of Operation Iraqi Freedom. The battalion also became the first U.S. military unit to reach 5 straight Iraq deployments and returned from their deployment in early September 2008. They are also one of only two Marine battalions with eight straight combat deployments, the other being 3/7. The battalion deployed in support of Operation Enduring Freedom in Afghanistan from October 2009 to May 2010, April to October 2011 and from March to September 2013. The battalion deployed in 2017 from April to October to Darwin Australia under the Marine Corp's Unit Deployment Program as Marine Rotational Force - Darwin (MRF-D). Multinational training programs were executed with participants from Australia, Japan, France and elements from the United States Army and the United States Special Operations Command. During the deployment 3rd Battalion 4th Marines established itself as a Marine Air Ground Task Force (MAGTF). Supporting elements came from tilt wing and rotary wing helicopter squadrons, logistics units, and engineering elements. The mission of the MAGTF was to build cohesion with the Australian Defence Force and the United States Marine Corps. The most notable exercise was Talisman Sabre. ^ Koopman, John (September 3, 2006). "Marine battalion heads to Iraq for fourth time / Tears flow as loved ones bid goodbye to unit members in Twentynine Palms". The San Francisco Chronicle. Retrieved 2006-09-21. ^ "3/4, CLB-7 return first hundred service members". Archived from the original on September 16, 2008. Retrieved 2015-12-15. Koopman, John (September 3, 2006). "Marine battalion heads to Iraq for fourth time. Tears flow as loved ones bid goodbye to unit members in Twentynine Palms". SFGate.com. Retrieved 2006-09-21.